Alamo Square Flea Market – Now Accepting Vendor Applications! We have acquired the street closure permits for our annual Flea Market and are ready to start taking vendor applications! 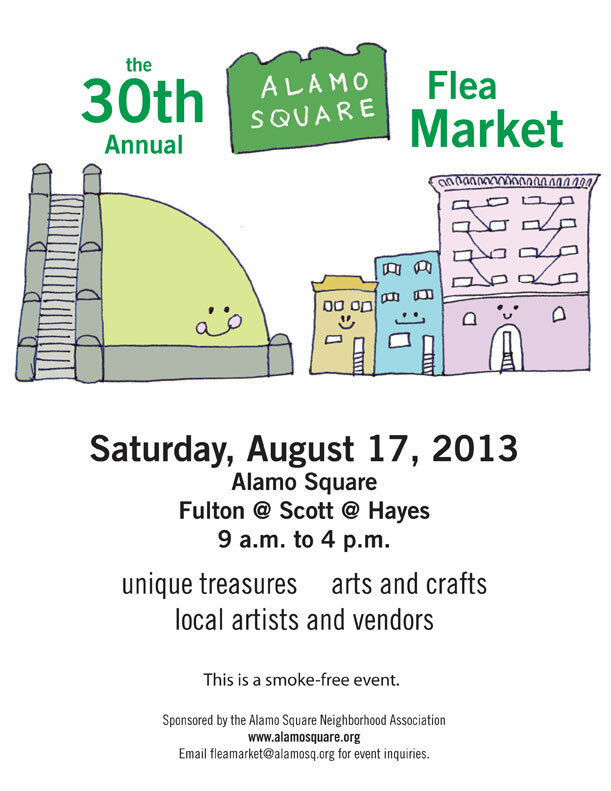 Please fill out the following form to be considered for a vendor spot at the 2013 Alamo Square Flea Market. Spaces are filling fast for our 30th Annual Flea Market! Join us Saturday, August 17th around Alamo Square Park. We welcome fabulous, creative, crafty, DIY, unique and fun vendors — like you! Vintage, Antiques, Crafts, Art, Etc! Booth spaces available on Scott Street, Fulton and Hayes St sidewalks. http://alamosquare.org/wp-content/uploads/2016/10/ASNA-logo-282x300.png 0 0 admin http://alamosquare.org/wp-content/uploads/2016/10/ASNA-logo-282x300.png admin2013-07-01 13:09:362013-07-01 13:09:36Alamo Square Flea Market - Now Accepting Vendor Applications!